In addition to the holiday dedicated to the sea, the sun and relax, you can plan trips to discover our territory rich in picturesque villages. Apulia is characterized by many villages rich in history and beautiful scenery. Campomarino is located in a strategic position because it allows you to visit the province of Taranto, Brindisi and Lecce easily. Thw nearest town is Maruggio,a refined centre of the Ionian province. The old town has a maze of narrow and winding streets onto which small whitewashed houses, and old mansions with ornate balconies and loggias face. There is also the Mother Church, the Clock Tower and the Castle. In this area there are the three towers the “guardians of the sea”, built to prevent the Saracens attacks: Torre Ovo, Torre de Mills and Tower Borraco. In the village there are several events throughout the year, especially during the summer there is the most important event: the “Path of Knowledge and Flavours”, which takes place in August in the historic centre, with the exhibition and the tasting of typical products of the area, visits to monuments, jugglers and concerts by pinches. 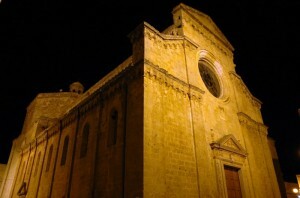 Particularly is the religious feast of Our Lady dell’Altomare which is held on August 15 with a procession at sea. Another closed popular destination is Manduria, an ancient Messapian city, whose civilization was present in the time before the civilization of Ancient Greece. You can admire the sixteenth-century buildings, the Gothic-Renaissance Cathedral, the eighteenth-century Imperial Palace and the Jewish Ghetto, a tangle of narrow streets and alleys of the medieval period. Manduria is also the symbol of the Wine Red Pugliese Wine with its “Primitive”, which has been recognized as DOC Wine. Social Cellars and small producers invite you to taste their wines. The town of Oria is rich in history and monuments of great beauty, such as the Castello Svevo, the Cathedral, the Jews’s Port, Lecce Door, etc. .. In addition, in the second weekend of August you cannot miss Procession of the districts, which is repeated every year since 1967: athletes and riders from the four districts will compete in the harshest medieval-style trials valid for the assignment of the “Palio “. A re-enactment of the medieval period of Federico II where over four hundred extras and flag-wavers in costume go by through the main streets of the town, sumptuously decorated with the colorful flags of the four districts. 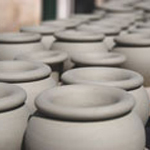 The processing of ceramics is definitely the characteristic for which Grottaglie is best known: there is an entire neighborhood reserved for the shops of artisans practising this ancient and traditional art. +40° 18' 24.34", +17° 34' 21.98"